The Cambus o May Suspension Bridge over the River Dee can be found just off the A93. It can easily be found by passing the AA Box 472 Ballater and turning off at the next layby. The path is signposted down to the old Deeside railway track and the Cambus O May Bridge River Dee is a short walk towards Ballater, Aberdeenshire. The Cambus o May bridge was built in 1905 to replace the ferry service that took passengers to the Cambus o May railway station. Looking away from Aboyne, when on the bridge, you will see the old Ferry Inn building as seen in the photograph below. This remarkable building with such a lovely view is now a private property called Cutaway Cottage. This Victorian suspension bridge was donated to the public by Ballater born Alexander Gordon who made his fortune in brewing in Kent and donated many buildings to the people of Ballater. He witnessed a drowning at this picturesque spot and wanted his home town people to be able to cross safely. It was built by Engineers and Iron-founders James Abernethy & Co of Aberdeen. The white painted iron bridge spans 50 metres with a light lattice truss wooden walkway of 1.2 metres wide. It is supported by steel wire rope cables and suspenders with lattice girder pylons with ball finials. The Cambus o May bridge Aberdeenshire fell into disrepair with the closure of the Royal Deeside railway track. For the public safety it was rebuilt by the then Kincardine and Deeside District Council in 1988 using the original design. It was opened by Queen Elizabeth, The Queen Mother in 1988 and remains a popular tourist attraction for those following the Royal Deeside and Victorian attractions. Access to the Cambus o May Bridge River Dee from the old railway line is through a turnstile and exit to the forest is by a swing gate. This photo shows the view along the old Deeside railway track which is now a popular walking route. 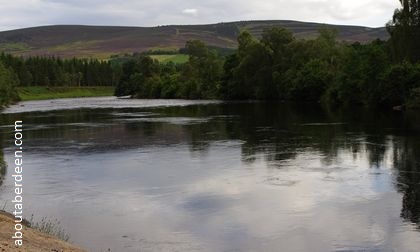 This picture shows the views of the Deeside hills from the Cambus O May Suspension Bridge.